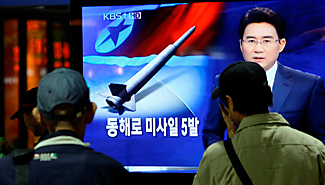 North Korea Test-Fires Five Short-Range Missiles. North Korea has test-fired five short-range missiles off the east coast of the peninsula, South Korea's Yonhap news agency has reported. The North had declared a "no-sail zone" off its east and west coasts for 10-20 October, Yonhap said. The launches come days after Pyongyang said it was willing to return to multi-party talks on its nuclear programme. North Korea test-launched five short-range missiles Monday, reports said, in what analysts said was an attempt to improve its bargaining position ahead of possible talks with the United States. North Korea has recently reached out to the U.S. and South Korea following months of tension over its nuclear and missile tests earlier this year. Leader Kim Jong Il told visiting Chinese Premier Wen Jiabao last week that his government might return to stalled six-nation negotiations on its nuclear program depending on the outcome of direct talks it seeks with the United States.